Wishing everyone the blessings of Easter and hoping that the renewal of spring will bring peace and contentment to all. 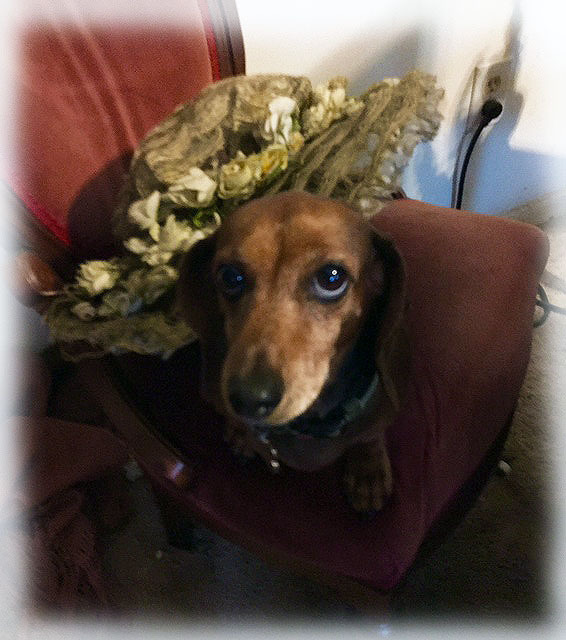 Those doxie eyes, she was not pleased about wearing my latest acquisition, a faboosh Edwardian summer hat. Most of Atlanta and its outlying communities shut down on Easter Sunday so I was busy running around on Saturday. We had a damp and cloudy weekend so it was off to my favorite haunts. Started off with a visit to Antiques in Old Town, Lilburn and one my favorite dealers, Cheryl, whose Romantic Farmhouse space is dreamy had this lovely hat. I had to have it and this gorgeous hat is a big one and I'm now trying to talk myself out of keeping it. Stunning Battenberg lace parlor tablecloth, is another lovely piece from Romantic Farmhouse. This is a keeper for me and I use them throughout my home. Now that spring is in full swing, I begin preparing for summer holidays like Memorial Day, 4th of July and Labor Day celebrations with lots of red, white and blue. 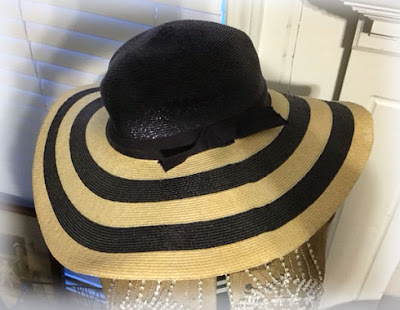 A sassy navy and white stripped, full brim hat is very 1950s. 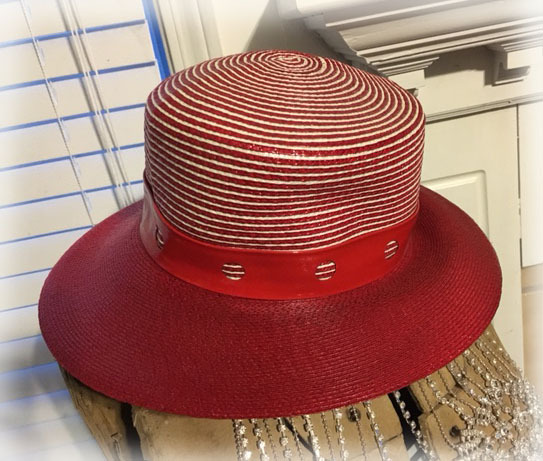 Another vintage, patriotic red straw hat with shiny vinyl ribbon around the brim. 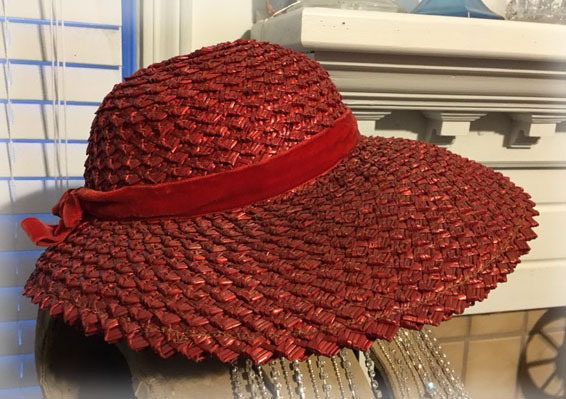 Swung by Curious Possessions in Snellville and found this pretty vintage straw hat. These will all be in my main space at the Buford Queen of Heart in May. 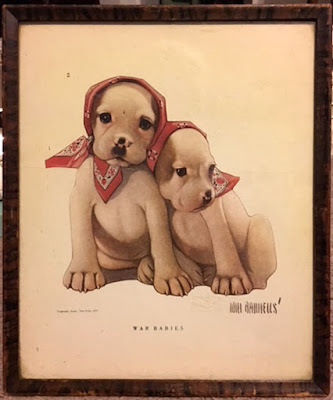 Delightful "War Babies" by Will Rannells circa 1917, puppies wearing bandanas print in original frame. 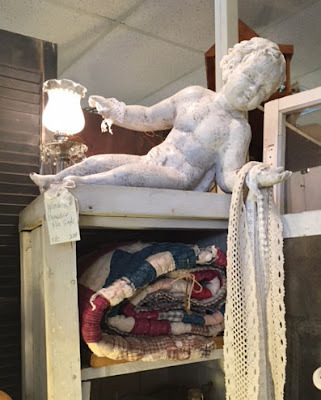 This sweetie will be in my main space at the Buford Queen of Hearts Antiques & Interiors. 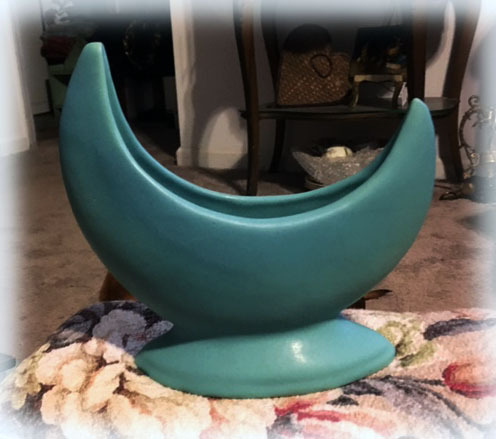 Gorgeous Van Briggle, blue matt crescent moon pottery vase came home with me and will stay for a while. I always get weak in the knees with this color. 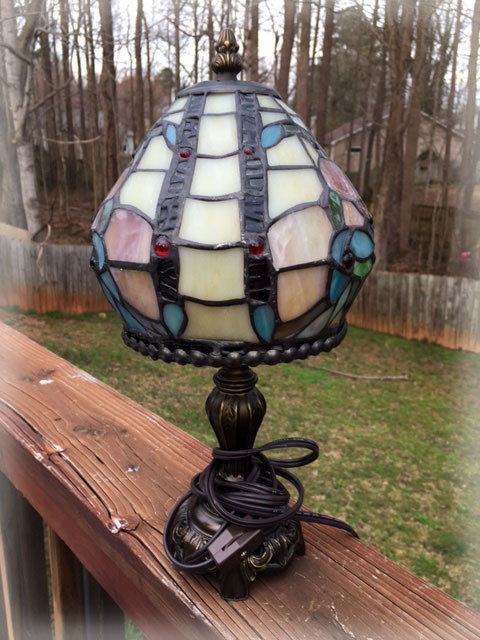 I'm a fool for antiques oil lamps and use them all year long. 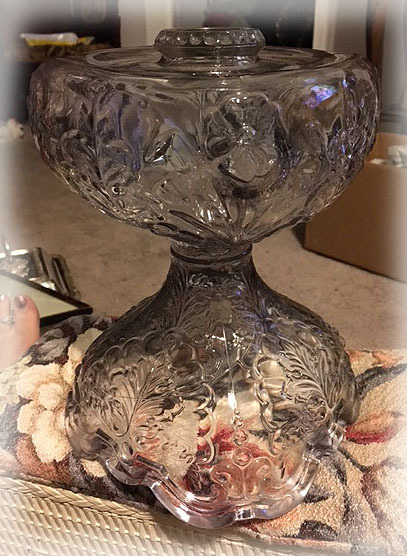 This gorgeous base is a huge piece and slightly sun purpled with the base in immaculate condition. 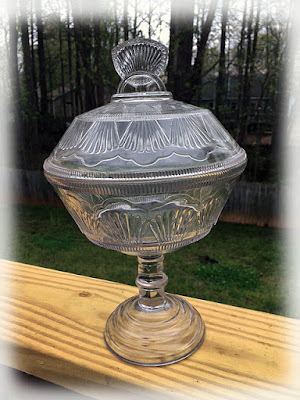 Now I'm on the lookout for pieces to make it a working oil lamp. 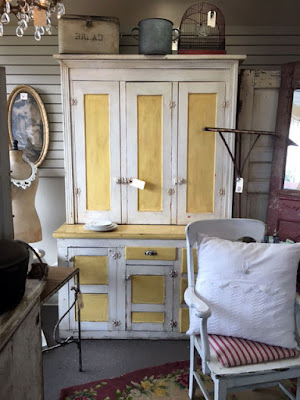 Found this beauty at one of my favorite antique haunts, Vintage Village. Now it was off to a few local Goodwills and thrift shops for more treasure hunting and it wrought an eclectic group of finds. 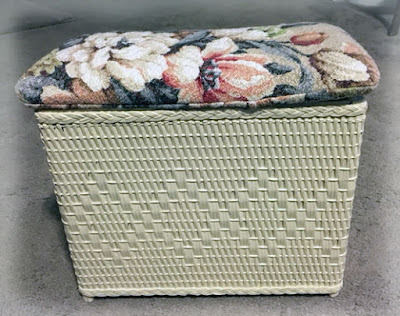 Darling, vintage lingerie hamper with a barkcloth lid. 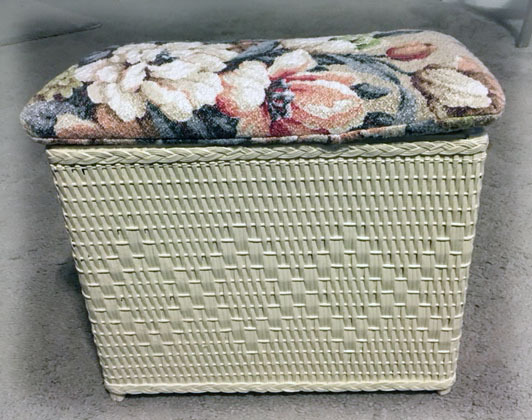 This beauty is much smaller than it's cousin the standard size clothes hamper and is small enough to put on a shelf or counter top. 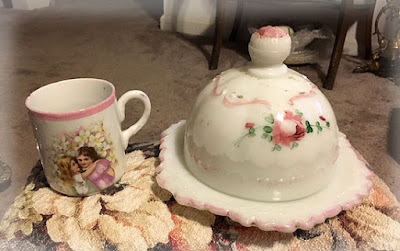 A thrift store find, this is the first small one that I have come across in decades. 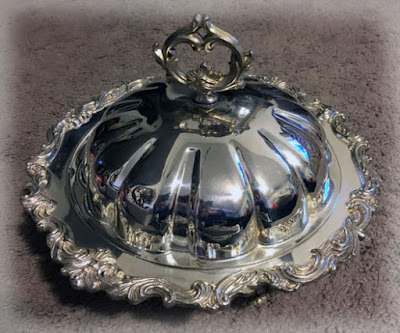 Lovely, silverplated serving dish is in like new condition. I can't wait to serve guests specialty recipes with it. Sweet pair of turn of the century items, a child's cup with hugging girls and a milk glass butter dish with pretty pink roses painted on it. It always amazes me what you can find out there. Bonjour. 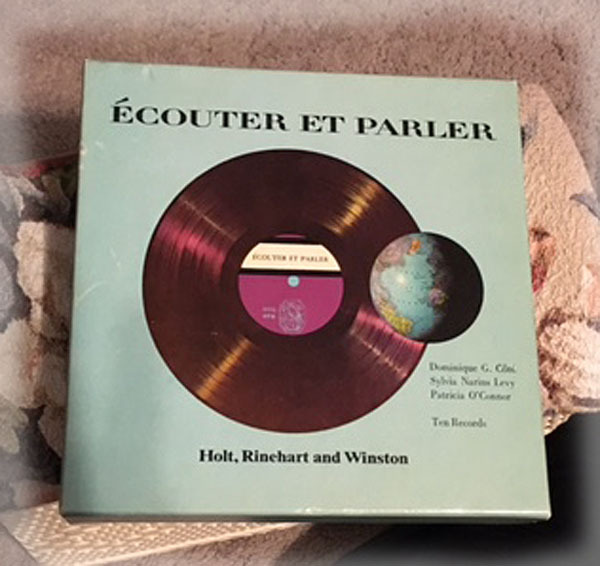 Nice set of vintage, French language lessons on records. 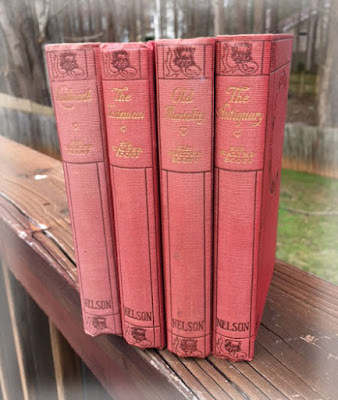 These will be in my main space next week. 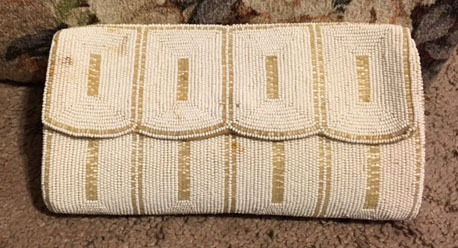 Sweet mid century beaded bag from Hong Kong. Do you use them, I do and they are great for holding your smart phone. 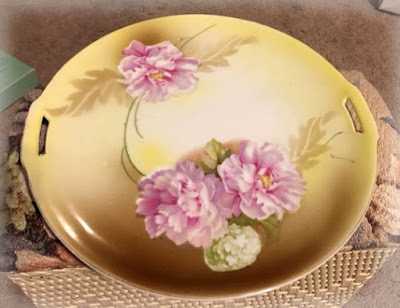 A delightful Goodwill find, this lovely plate is handpainted and marked Bavarian on the back. 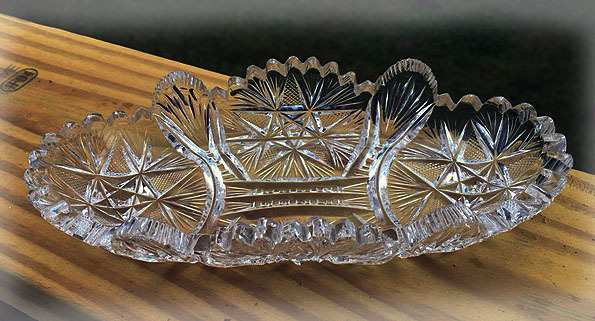 Early American Pressed Glass is beginning to see a wider demand with collectors. With so many patterns to choose from you can often find fantastic pieces for a few dollars. This medium size compote has a sassy topper and is now in my personal collection. Lovely early cut glass olive server. This is a smaller piece, about 6 inches in length and has lots of sparkle. 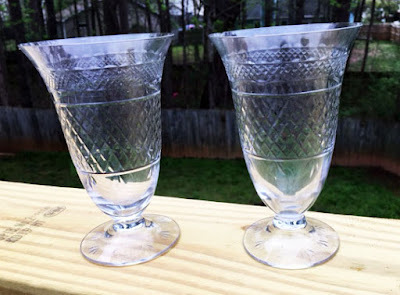 Pair of gorgeous cut glass water goblets from the late Victorian era. 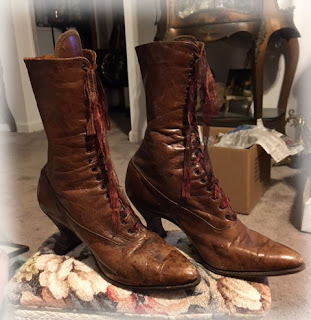 These will be in my Victorian space in April. 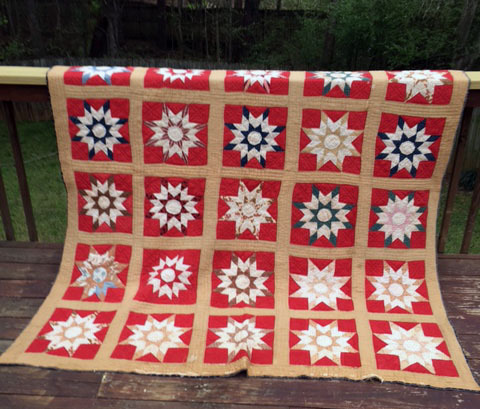 gorgeous, early 1900s hand pieced and quilted quilt is rich with calico fabrics and a feed sack back. 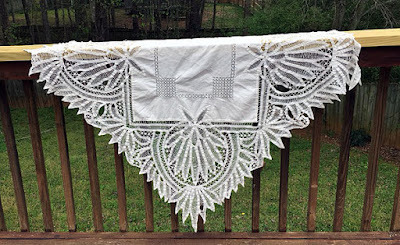 Many of the calico fabrics in the squares have shredded rendering this a cutter quilt, but it is so lovely, I will display it until I decide how to use it. UPDATE: It's coming. IT'S HERE!!! It's coming. IT'S HERE!!! It is spectacular and it will be delivered this week. Have I grabbed your attention? 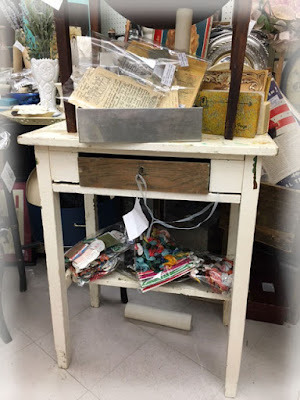 When it arrives, I will update this blog post. Swoon, oh so swoon. 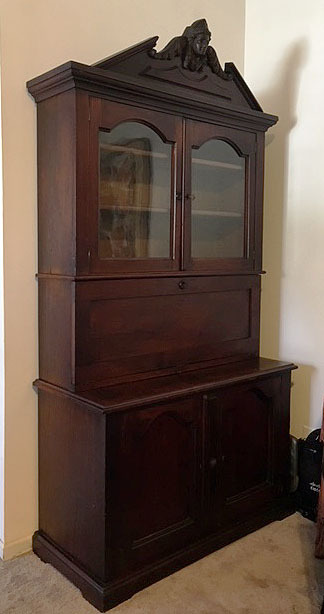 I have watched this stunning, Germantown, Pennsylvania, American Black Walnut bookcase be auctioned off four times at my local auction house. 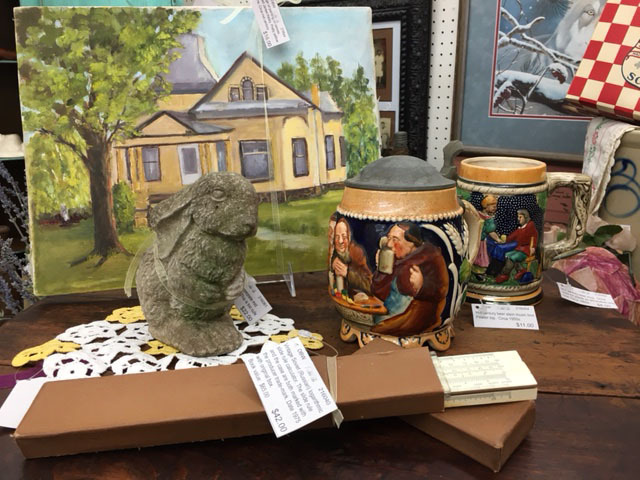 Each time it was put back on the auction block for not meeting the consigner's reserve which was several thousand dollars. I have coveted this piece since I first saw it 6 months ago. Everything that pushes my buttons, American Walnut wood, an American piece and Lady Liberty at the top impediment. 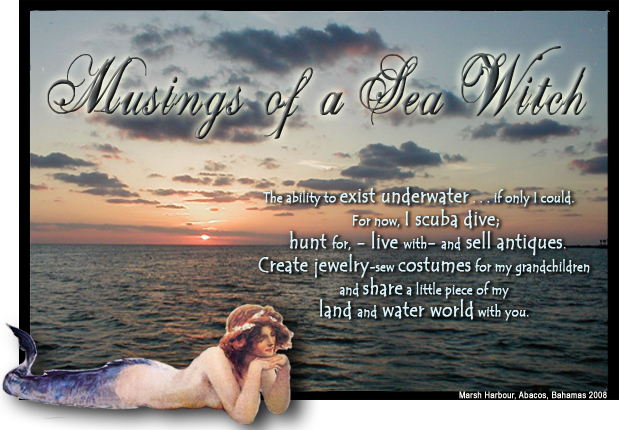 Well, lucky me, the consigner lifted the reserve and the usual folks who would have made my ceiling their opening bid were not at Saturday's auction and this Sea Witch was the winning bidder. 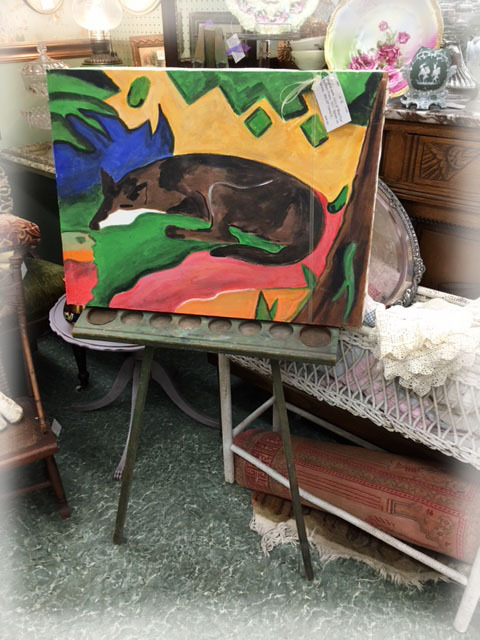 I think this piece knew it wanted to come home with me as I will cherish it so. 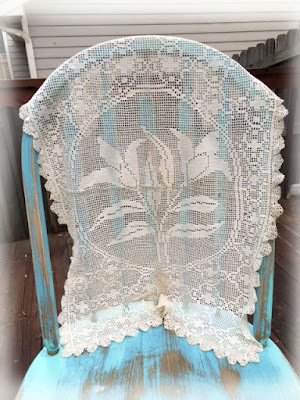 American Empire, ahh, a furniture period I adore. 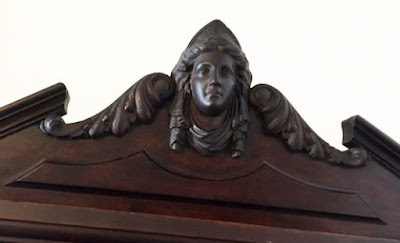 More popularly known as Minerva (Athena) on Empire and Revival furniture, stalwart Pennsylvanians preferred Lady Liberty. 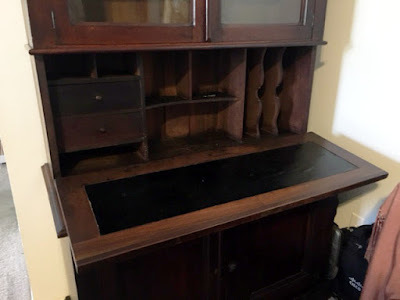 Next to my spinning wheels and captain's desk, this is my most cherished piece of furniture. Thank you for letting me share my enthusiasm with you. For now, I am already overjoyed with the time change. I have been a whirling dervish of activity...cleaned out the second inventory room, took another vehicle load to Goodwill and I can now see inventory clearly and can access it quickly. 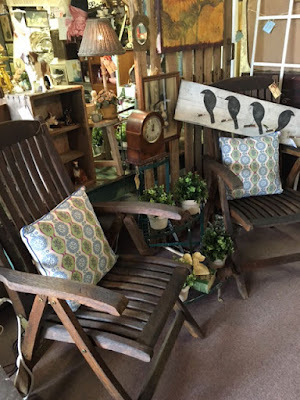 I am so glad I finally got these two rooms reorganized and now it is on to the garage. 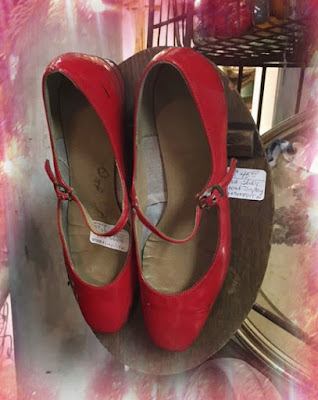 Made a visit to Vintage Village to see the spring treasure. This shop only gets more beautiful as the seasons change. Spring abounds here with garden goodness and Easter chicks and bunnies. My Vintage Heart always finds the prettiest pieces and this dreamy white, kitchen cupboard with maize yellow inserts is "the bees knees". Get your garden on with bunnies, spools and flowers. 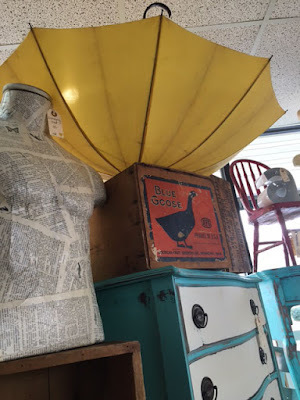 Pretty vintage umbrella with blue Goose box. 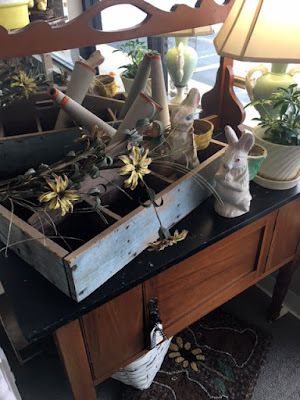 Darling decorative elements. 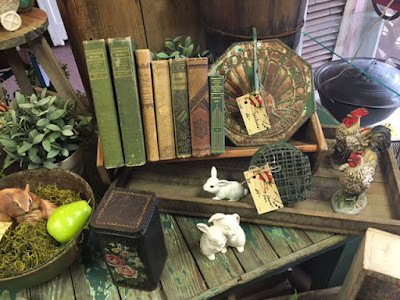 This space had marvelous vintage books and garden pieces. 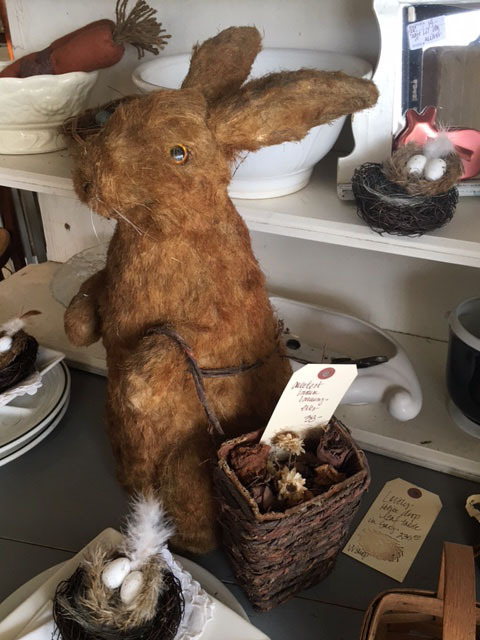 Sweet vintage look bunny and basket is looking for a home. 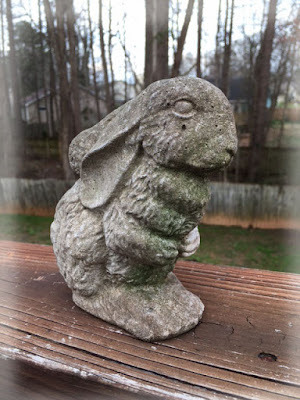 He is about 14" inches tall and just so cute. 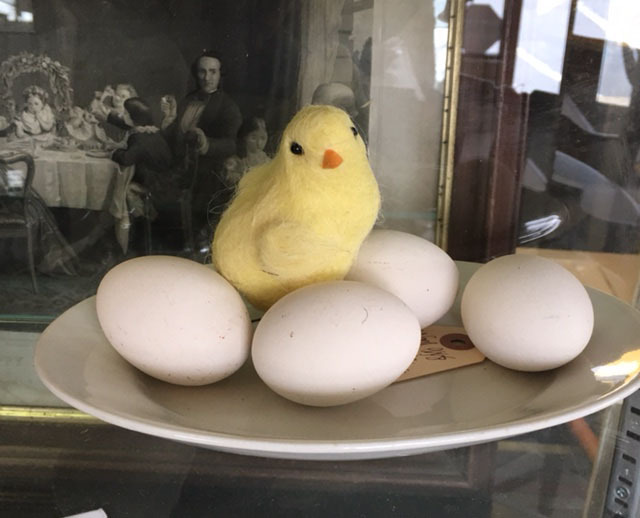 Peeps are hiding throughout the shop. 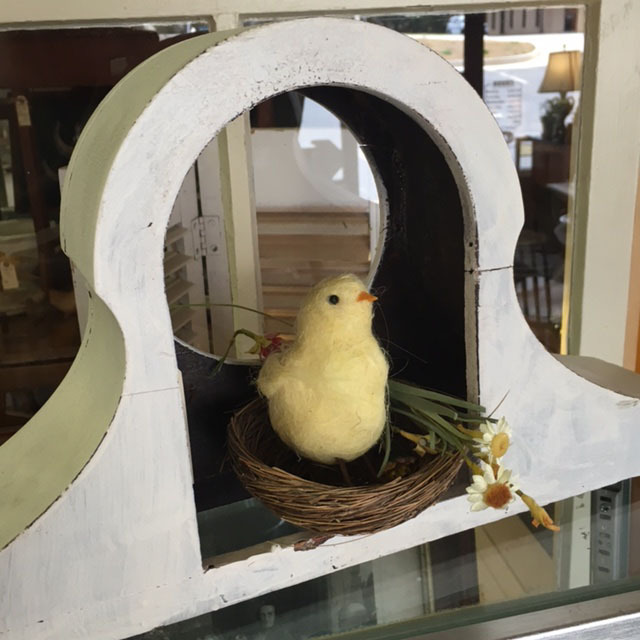 This little peep is nesting in an old clock body. Sometimes the framing of display pieces is perfect. 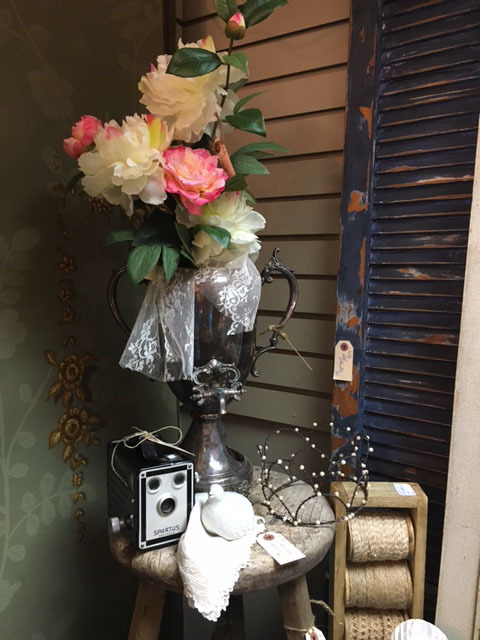 This dealer brought together lovely vintage items with faux peonies against a vintage screen, back wall and antique shutter. Lighting was perfect and this is the shot I captured. I adore the "painterly" look this has. So many pretty things to find here. 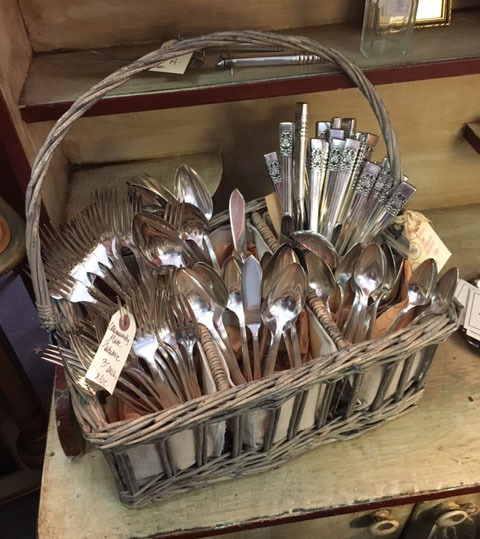 You can never have too many utensils, especially with the warmer weather coming. Everyone loves to cook and eat outside. 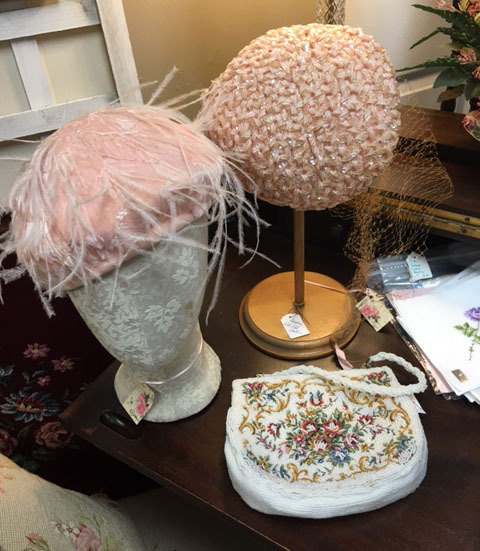 Pink feathers and sequins on sassy hats and a pretty beaded handbag. Click your heels three times and say, "There's no place like Vintage Village, there's no place like Vintage Village." Great folding wooden chairs would look cozy at a lake or mountain home. 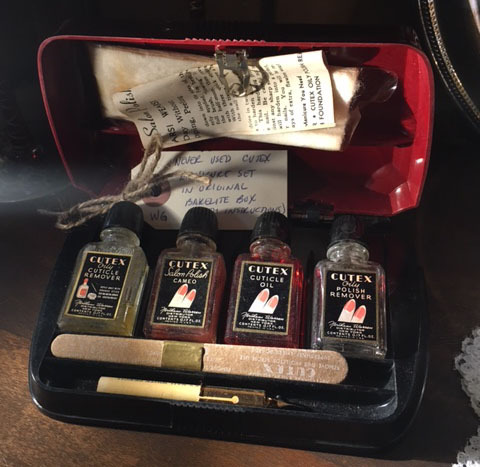 Darling vintage Cutex kit is the perfect gift for a nail technician. This dealer has the best American Primitive pieces, EVER! 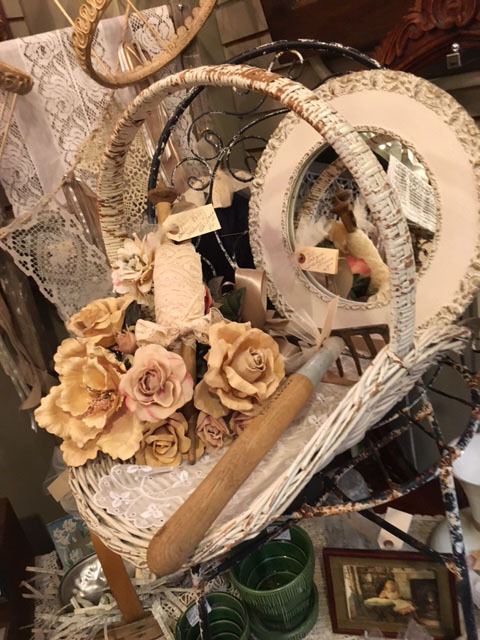 Faded roses, chippy gathering basket and pretty linens. This adorable cherub makes me laugh. If I had a tall cupboard in my bathroom, this little imp would be above it with a handtowel to give me. Came home with a bag of treasure from Vintage Village following morning auction wins. Lovely, hand hammered silverplated bowl. 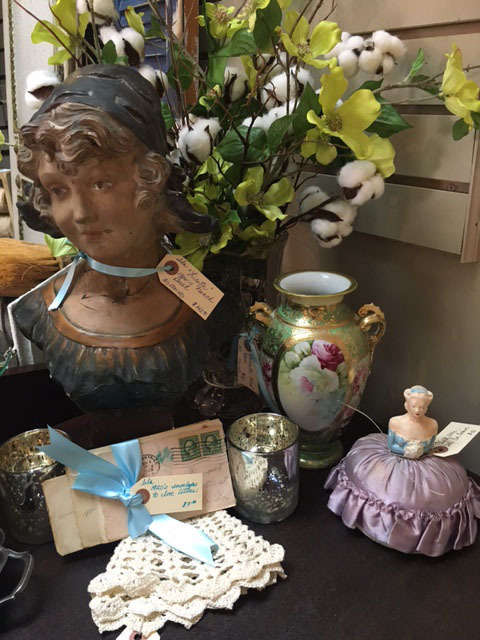 Darling little decorative lamp is an Antiques Roadshow offering. 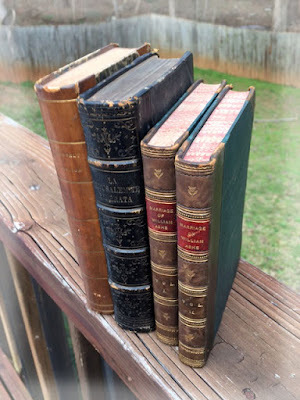 Won a box lot of antique books. French, German and British publications and some as early as 1831. Nice box lot of German mugs and steins. One of the sweet little bunnies that was running around Vintage Village. 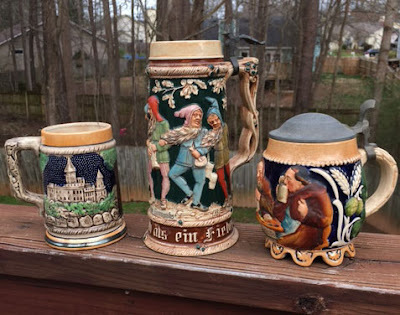 As I downsize at home, I am bringing in pieces to sell. 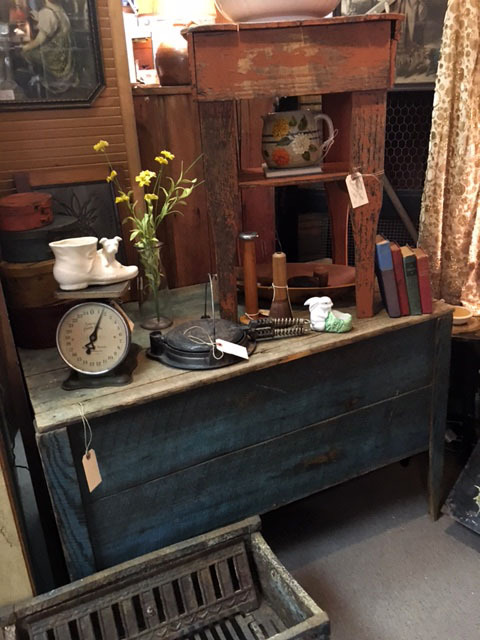 This heavy and solid oak table with drawer has so many layers of paint on it and a perfect end table. 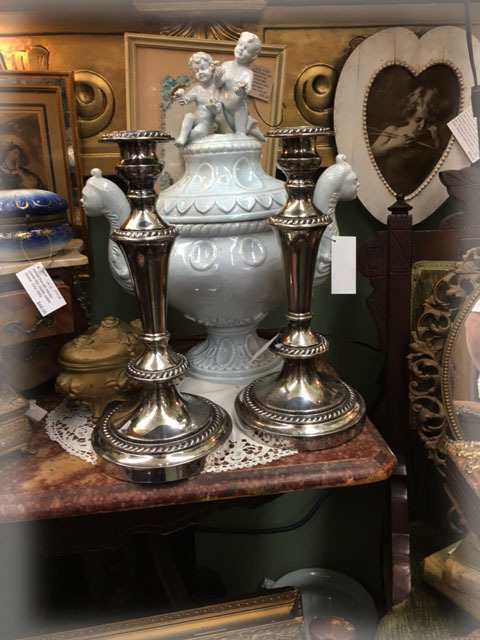 An auction win, this stunning and heavy pair of vintage candlesticks are silver over copper. 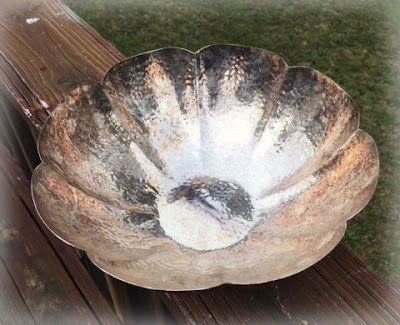 They polished up beautifully. 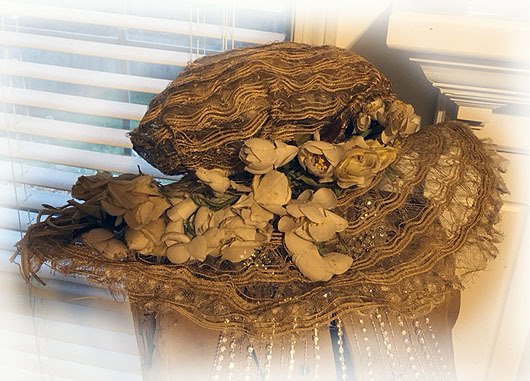 Another personal piece that I am selling as part of my downsizing. About 10 years ago, I purchased a huge lot of acrylic on canvas pieces from an old man who painted non stop. He would reproduce a variety of "master's" works and this one is called the "The Blue Fox" by Marc Franz, 1911. This piece always makes me smile.